Today mum and I got up early because we were off to buy some trainers and since it was a very sunny morning I decided to wear something cool and I went for this kind of boho-look with lots of reddish terracotta colours, some ditsy flower prints, leather and tassels. Most of the things I wore are pretty new and I don't think they were already featured here, so let's go over to that very quickly! My hat is new and I actually got it from Primark, but I thought it was too cute not to buy it. My flower top has three quarter length sleeves and I tucked it into my high waisted skinny jeans from Topshop. The top itself is from Orsay and I've had it for a few months now but I never got to wear it until this morning. I tied a wash out black kind of corduroy shirt by Versace around my waist to give my outfit some more layers and I also thought of maybe layering it on top of the flower top in case I'd be too cold. 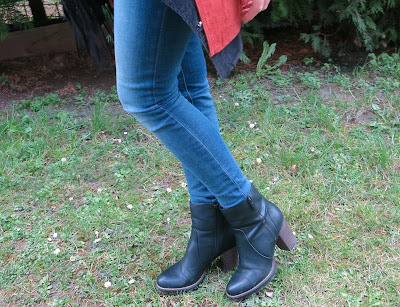 My heeled leather boots are from Deichmann and I wore them quite often during autumn/winter because they really go with nearly everything! 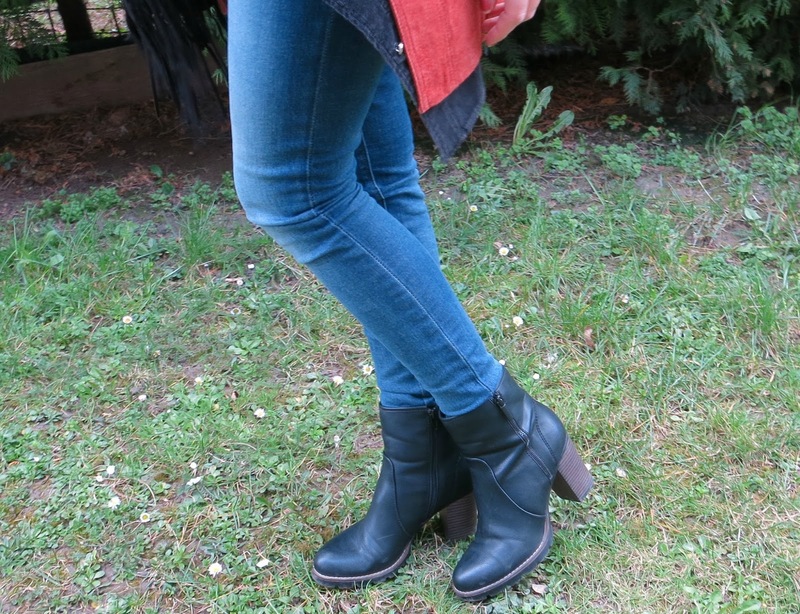 My red leather coat is from Forever21 and I am IN LOVE with it! I think it's such a unique, sophisticated looking piece because of the colour and the detailing. I really like how it goes with my silhouette! I think it is a good time to own such a coat because that leather/boho look is pretty in just now and I'm sure such things will never really go out of style anyways. 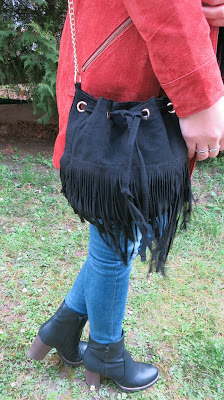 My little tassel bucket bag is from H&M and at first I thought I'd just use it for summer when I was in the country, going to the grocery shop, using the bag for some money, my camera and my phone. But when I actually decided to wear it out a few days back, I got really surprised by how much this bag can actually hold! I can fit my tangle teezer, phone, camera, big wallet, a lipstick, chewing gum and stuff like that inside and I think this is impressive. 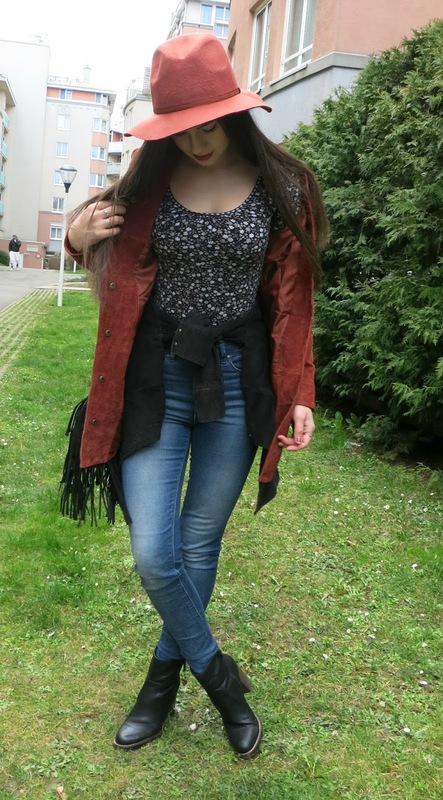 And I also really like combining it with this leather jacket or my denim jacket too. 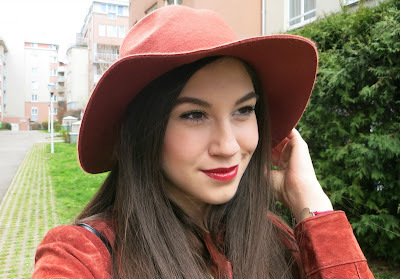 I wore my hair down, obviously because of the hat, and my make-up was just my usual one, plus a dark red lipstick by Givenchy ( I don't know the name by heart so if anyone is interested just let me know and I'll add the information later if needed). I really like this shade because I think it suits my complexion very well and also, for this outfit I think I couldn't have made a better choice.